Subject: Review: "The Fifth Vortex - Ehactora's Story"
I don't think I have ever played a custom mappack so many times consecutively since its release. Perhaps because I had to write up a clearer-than-clear opinion about it but no, even after five playthroughs I'd like to enjoy it a sixth time. The Fifth Vortex - Ehactora's Story is a beautiful mappack. And it's very true to the original Unreal atmosphere, maybe too true to the point that some locations literally look like already seen Na Pali ones. It's known that original artists such as Nivlek and Shade Caudle have been credited as some of their works have been re-used there but this is the second time I see the geometry of DM-SunSpeak in a Single Player map, and the first time happened not too long ago. It isn't important anyway, at the end of the day you want to enjoy a new group of very decent Unreal maps. The Fifth Vortex - Ehactora's Story, developed by Doublez-Down and Teridax, contains five playable maps plus an intro and an outro. It took around two years for it to be finished and I say: the wait was worth it. Aside the aforementioned use of the stock geometry from Unreal, two people worked on the maps. Now already with two people you can expect build quality inconsistencies but thanksfully there are next to none here. The outdoor section of Valley of Ehactora (Map 3), by Teridax, seems to have a quite different and simple lighting setup compared to the rest of the pack and that's the only awkward thing which caught my eye. Everything appears splendid; this is what I'd define a down-to-earth, upgraded vision of the Unreal world in the old engine. It surely doesn't have sections with incredible eye-candy but supposedly I haven't seen any rule about post 2010 releases that must necessarily have ultra detailed architecture at every step to be accepted. You don't want to spend one extra month just to needlessly impress people for one extra % of build quality unless you're a long veteran of editor techniques. The Fifth Vortex comes with a lot of variety. 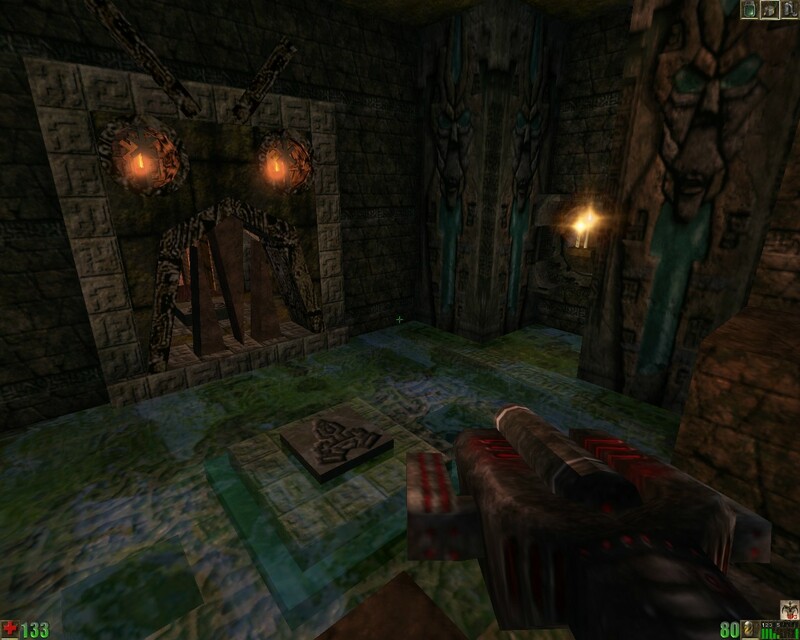 Lots of classic locations such as Spire-themed valleys, sacred passages, many temples, a small human starship, sky islands, aztec ruins having wooden planks over shiny water filled with Devilfish, a lone peak in the middle of an abyss, an arcane temple with two curved staircases filled with spinners leading to a corridor with spikes crushing you and more. While being sarcastic on the fact of some locations being copy-pasted straight from Return to Na Pali (not always however, for example the Gala's Peak lookalike map only has part of the original terrain unmodified), the mappack keeps things fresh with different and new themes - even an Unreal Beta-style desert zone appears! The only time when the build comes next to disappointing is probably in the Sky Islands portion. While it's very short, I can't help but notice the shoddy skybox: it's way too flat in the horizon, the moon is placed weirdly and the other decorative sheets seem squished. One certain story detail that you can spot could make up for all the present issues, though. There's no denying that the architecture is great and well-planned. Releases such as this one make me go back to appreciate simple visuals over super detailed brushworks. The few HOMs are unfortunately a bit easy to spot; there are also some invisible brushes (one of them is visible on a upper ledge of the exterior part of the Vortex building in Map 4). Texture choices are about as perfect as possible. With few exceptions: first, the doors in the crashed human ship of Map 3 have a completely unrelated texture; second, always in Map 3, I noticed dead bodies sitting on... grates of red blood? 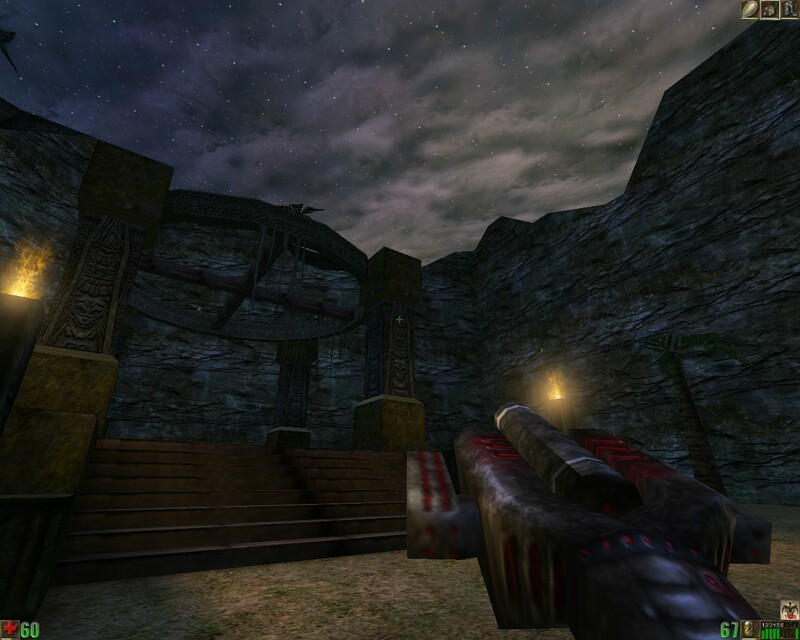 I'm assuming the MyLevel texture doesn't work too well in Unreal Tournament; third but the least important, due to the emptyness of various areas you may see the same texture being repeated too much. The lighting department feels solid but is definitely less so in several outdoor sections where it falls flat. Comparing Map 3 and Spire Valley/Village, I feel the latter having a more natural illumination instead of a monotone, saturated blue. However, there's one unexpected scripted sequence that temporarily alters a lighting setup of a map and it is amazing. What a great job. About the sounds, for some reasons I can't seem to remember how this field performs. The first music track which comes to mind is Mountain for once, which is a surprise. Each map comes with only one ambient track; I'd say the "new" Gala should have got something different than Surface, considering there's some sort of boss battle in it and the music still doesn't change during it except going off for an optional path which leads to a Skaarj Berserker... Random suspension? Sacred definitely fits Map 3 even if it's more based on Spire Valley than Nagomi. WarLord is used for the last battle. Sound effects are fine and I have nothing to comment on about this. Now, every time I recommend this mappack to somebody, I always mention "be careful, one Predator is worth three Skaarj Warriors" or something like that. The Fifth Vortex is rather easy, veterans can just crush the maps without dying and by using the Dispersion Pistol almost always. However, it requires a lot of reflexes and preparation (note: I only played on Unreal difficulty, so all my remarks are true for that difficulty only). It can become suddenly tough from Map 3 onward due to a big lack of health items; only around seven Seeds will keep you up until the end as long as you find them. Luckily, there doesn't seem to be a case of enemies dropping Seeds unlike the Krall with ammo in Map 4. Let the Krall fall into the abyss and say goodbye to a bunch of ASMD Cores. Creatures holding ammo is a gamble, especially if you don't place the items directly in maps. Which is not the case here and not to mention you'd probably use the Dispersion Pistol a lot since most of the battles are against weak wildlife and Tentacles. Placement of Tentacles is nowhere near as annoying as in Archsub but it's clear there's barely any thought or effort on their use there (if none at all). You run around a corner, you fight a Tentacle. You cross a door, you fight a Tentacle. You exit from a water pool, you fight a Tentacle. You enter a colossal building, you fight a lone Tentacle in the exact middle of the roof. You also get to avoid arrow-shooting traps and deal (optionally) with small Spinners that respawn infinitely, and that can kill you as fast as the regular ones. This happens near the end of the game, right before the boss. These are mostly the issues with the second half so let's go back to the first one. Here, we get Predators on steroids, and the very first battle is against them. For a first timer, it goes probably like this: you find a Nali, trying to seek his attention by going right next to him, you succeed, but five seconds later and you have two Predators ending your life and the Nali's one in about six bites. Okay? This will be almost the same for any battles against them. They're unrealistically overpowered, especially for their size. So, unless you exploit their AI by standing on a steel box or slowing them down in the water, enjoy arthrosis by constantly tapping the directional buttons for side/back dodging (usually results in death). I encountered also a big Predator but I haven't dared to get bitten by it. Save the game if you manage to spot one, and think how to use the environments against them in a very cheaty way. This is not Gala's Peak without snow. Most of the other gameplay problems are nitpicky and mostly leave you scratching your head. For example, why there's an Invisibility (together with the "Who's with Vandora becomes as elusive as the mist" message that everyone knows) right at the end when it's no more needed? The portals in the last map cannot be used to go back; you also get some scripted help from your friend who uses the RTNP flying shuttle just to blast a Behemoth that you probably already killed from afar. And I think I noticed that shuttle coming out from the abyss in Map 4? Could have helped against the Predators instead. Lastly, you have to deal with a sudden fight against a Slith in the water. With these, the gameplay still remains very fun. You don't have to deal with Skaarj Troopers which is already a big plus, and there's something that I really enjoyed: sneaking past Titans. Personally, I think Titans have become extremely stale now. When I encountered the first one, I was just thrown off that I had to shoot 30 grenades or so against it otherwise the final door magically wouldn't open but I noticed that you could unlock the exit by yourself. The Titan can go screw itself. Same for the second one, which you can sneak through by crouching - one of the times where stealth in Unreal works wonderfully, finally. The boss battles are also enjoyable and come with their nifty startup sequences. The final battle can be aggravating if you're running out of health and if you have scarce ammo for the most damaging weapons. Just be sure to plant some Seeds around; the last time I faced the boss, I was able to beat him in one try with the Eightball plus with what I had of the Flak Cannon and the Rifle. Speaking of the weapons, you just get the Automag, a Stinger (fail to let the first Nali survive against the Predators - which is likely if you don't know what to do - and you won't have this one for a while), an ASMD and the Eightball. These are your main ones, but you can find some Dispersion Pistol power up batteries and a limited amount of Flak Cannon and Rifle ammo that are preferably saved for the boss, as I mentioned above. You can also get the Minigun, however you have to jump on little platforms over a burning floor and it's not worth losing health accidentally for a weapon that is unable to kill anything with less than 50 Automag bullets. A feature of The Fifth Vortex is secret areas being opened by getting golden cups. If you pick a golden cup, a secret area immediately opens so it's not the key-to-open way. They are pretty rare anyway and both secret areas and the cups are easy to find, not letting you invest into more effort for survival which is nice I guess. Strangely, one of the golden cups is used to open an exit door of a level which was found right next to it. I find this very funny. One of the many locations of the final map. The story is set 25 years after the events of Return to Na Pali. I don't see any issues with pollution or random cataclysms so I believe Na Pali is still as nice and lovely as ever. Your objective is to find The Fifth Vortex, a technological artifact capable of teleporting living forms anywhere on the planet, before the few remaining (and cowardly considering how most of them decide to strafe backwards) Skaarj do the same. And from what I saw, they got pretty close considering all their complains in the messages. While the titular god, Ehactora, seems to have been heavily bullied by the deities he created because instead of stopping Skaarj, he brought them in. With force. Who created Tarydium in the first place? We need more stone tablets about them. Jokes aside, the story is not-so-interesting but nicely detailed and the Fifth Vortex's effects are visually legit (story-wise also). Last boss receives a build-up only during the final section of the game. Map 3 has some translator messages from dead humans that must be read because they give you suggestions on how to proceed. The first time I didn't and I got stuck for a long while. Other than the HOMs and blood texture bugs, a major bug is getting the dynamite pack from the cabinet in Map 3. You have to run over it several times until the collision system of your player finally detects the trigger. If you accidentally get into the cabinet you must ghost away to get out of it. It's been mentioned that the SCUBA Gear disappears after the first map but it hasn't happened to me. 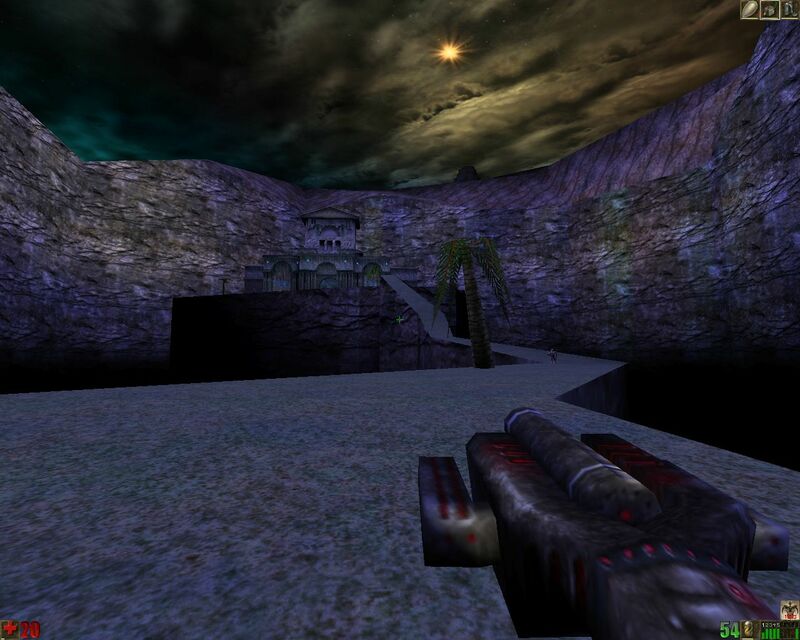 While The Fifth Vortex is recommended to be played under Unreal 227, it runs on Unreal Tournament perfectly, except your weapon appearing in the intro and the outro cutscenes when it shouldn't. If you can get over the fact that little dinosaurs have become creatures of mass destruction and the use of stock content, The Fifth Vortex could be one of the new most fun, unforgettable custom mappacks ever released. Welcome back again, Unreal atmosphere. Subject: Re: Review: "The Fifth Vortex - Ehactora's Story"
Might check for some grammar mistakes tomorrow. Doublez you're free to let Teridax know about the review in private. There are a few grammar mistakes but nothing major, mainly some run-on sentences that most won't notice unless they are English teachers. Wasn't expecting this until after the new site was up - thanks for getting it done. I still haven't been able to play this one due to the fact that it crashes both Unreal and UT for me (I'm not really keen to download a D3D update just to play one campaign when every other SP works for me). Otherwise I likely would have played and written a review for this one by now, as someone who has been following Rob's levels with great interest. So UB, I can't vouch for your review in terms of a hands on experience but I can view it as someone that hasn't actually played it and is interested in downloading it, which is a unique angle for me. I've read through the review twice and it seems detailed with aspects of the level yet somehow doesn't tell me why the level is so good besides "it's got that Unreal flavor baby!" I'm also surprised and happy to see such a high score for Story Implementation (a 10!?) and Story Construction, given what I've seen and read from Rob's other levels. Clearly this is a big improvement then. Perhaps Teridax had a hand in this this time? Anyway, for such high appraisals as you have in there I would maybe consider relegating a couple of extra paragraphs on those points (Conceptual Grandness as well). You've also stated that Gameplay Awe is a 9 but then said how the level is easy and can be handled with a dispersion pistol if vets were to have at it. I'd maybe consider adding a bit more to this, as highly review packs tend to need a little more meat to explain the whys and I'm left feeling the critical stuff ain't there even though you have a whole of words in there. The main thing is that some of your scores don't come anywhere near to validating what you have stated in some cases. I was also kind of confused to the reduxing stuff. I know Rob has modeled areas off UT maps before but built them from scratch. Are these areas done similarly or are we revisiting parts of RTNP? Maybe I just didn't get that comment. As for technical stuff, some paragraphs can be formatted a little better. The paragraph that begins "speaking of weapons" has a funny line at the bottom. This happens in a lot of the early paragraphs too actually, double check. MP, I'm really not sure why you're having issues with playing the pack. No one else that I know of has mentioned having any problems. I use the OpenGL renderers simply because they seem to perform so much better, but I don't think they are needed for this pack - at least I'm not sure why they would be. I'll try it in D3D and see what happens though. EDIT - Tried D3D, and it worked fine on my UG 227 version but crashed on my UT version saying that it "encountered oversize texture without sufficient mipmaps" whatever that means. Ironically, it's probably got to do with the mylevel textures used to get the shadows...which I read how to do in your tutorial. At any rate, I'll get with Teridax and see if we can fix that. Strange no one else has mentioned it. I can also agree that some of the scores seem high when compared to the review. I obviously don't want to praise my own work here, so I'll leave that to UB, but I agree that some of the scores could use coinciding comments in the review. As for using other's works, there were a small handful of borrowed brushes, and all authors were credited for them in the readme and in the entrance text to maps. These were: hallway sections from DM-Sunspeak, as mentioned in the review; Arcane Temple's entrance (heavily modified); and a section of Gala Peak's terrain. That's it as far as I remember. I agree the review could have maybe explained this better. For what it's worth, I had originally planned on pumping this pack out in about 4 months or less, and the player was going to teleport to "familiar places", so I was going to piecemeal it together with some borrowed brushes. Those plans obviously changed, but I didn't want to go back and delete the content that was already there. Just my .02 for what it's worth and if it helps. Last edited by Doublez-Down on 21 Jan 2014, 23:14, edited 1 time in total. As for the problems I'm having...I'm willing to bet that they are really just my problems. With my new rig setup I've been enjoying playing Unreal and SP levels using D3D and up until this one have had no issues. I've considered downloading a D3D update of some kind but I'm hesitant. I have not played the pack on 227 yet and I understand that was the primary platform, so I will likely end up trying that next before I do anything else. 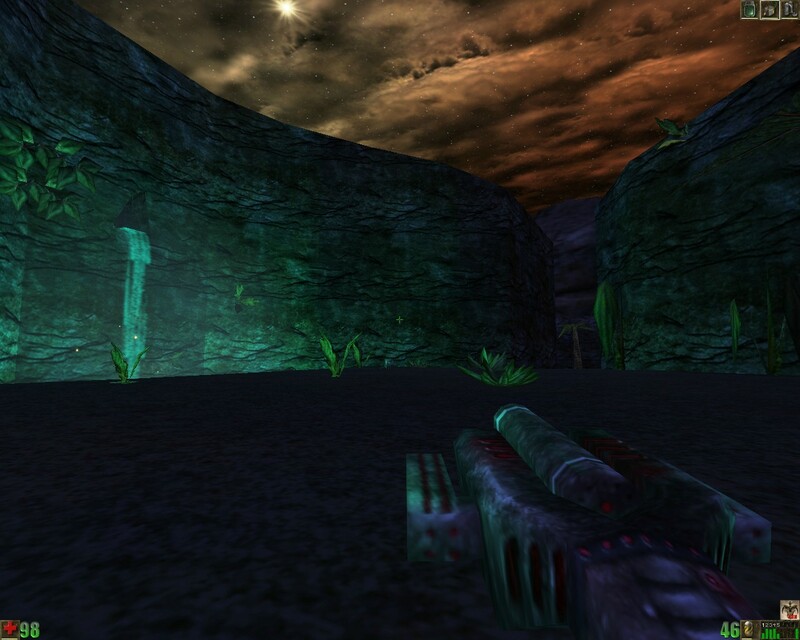 The problems I had were with Unreal 226 and UT 436, right after the intro and the following level loaded. See my edit above...had the same issue on UT with D3D, same spot as well. Oh wow cool I'm not crazy. I have tested all my levels in D3D using the same shadow technique detailed in my tutorials and used the method on new level content, so I'm curious now as to what might have happened for you if it is related to shadows. Keep me posted on what you find, maybe I can help. Or maybe walk me through what you did. Did the same thing for the last level of mine you reviewed though, and you seemed to have no issues with running that one. Can you come on chat so we can troubleshoot? I've been on UED scouting ideas and I wanna leave the thread open for UB's review needs. EDIT: DD, I sent you a PM with my findings so far. Last edited by Mister_Prophet on 22 Jan 2014, 00:01, edited 1 time in total. I couldn't get to do some edits today. The Small Campaign list (which this mappack will be part of) is pretty screwy when it comes to scores. The comparison target in this case was none other than Shrakith'a which is the highest rated one of the group. Considering One Day and Hexephet got such high ranks it would leave me perplexed to see The Fifth Vortex being rated lower than those when I personally found it such a leap of quality from those two old campaigns (maybe not so much from Hexephet). I've always went to the score comparison way since my first very review. Then I'd still think they're appropriate ratings. I mentioned the blood texture bug of Map 3, I think it's a UT only issue though. Perhaps I'll still kick it down of 1-2%, maybe that 10 is a bit too far. Doublez-Down wrote: "encountered oversize texture without sufficient mipmaps"